Summary: Ever wonder what Rachael Ray cooks when the cameras aren’t rolling? Here she gives you an inside look into her kitchen for one full year. My Year in Meals offers intimate access to tasty dishes that will take you from breakfast to dinner. From the meals she whips up at a moment’s notice to family feasts, and dishes inspired by her travels around the world, you can now enjoy twelve incredible months of Rachael’s homemade favorites. In the past, I haven't always had a lot of luck with Rachael Ray's cookbooks. In theory, the recipes should be perfect for me. They are usually fairly quick and use easy-to-find ingredients; however, there have been only a few that I've really considered "keepers." For whatever reason, every single time Ms. Ray comes out with a new cookbook, I want to check it out. Her latest MY YEAR IN MEALS was no different. The premise behind MY YEAR IN MEALS is fairly obvious from the title. This cookbook chronicles Ms. Ray's actual meal plan for a year. I've often wondered if celebrity chefs really cook the way they do on television, and this cookbook proves that Ms. Ray does. The recipes are very similar to her other cookbooks, and I even recognized one or two that I've seen her make on television. MY YEAR IN MEALS has over 500 recipes including breakfasts, lunches and dinners. I'm not sure I'm head over heels in love with all of the recipes because Ms. Ray tends to use a little too many condiments for my family's tastes. (We are a mayo, mustard, and ketchup-free home!) However, I did find quite a few that I want to try when my life calms down a bit after the holidays. As far as the format for MY YEAR IN MEALS, I thought it was positively adorable and very user-friendly. 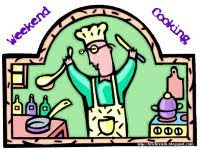 There are small photos for every recipe which really helps cooks like me who need to see a photo before making something. In addition, the book is set up by month (beginning in April) with a calendar showing, by day, the various recipes Ms. Ray made; and then follows with the individual recipes along with Ms. Ray's personal notes about the meals. Some of the text looks like actual handwriting so that's makes it cute too. MY YEAR IN MEALS is also a "Smart Book." That means that there are tags throughout the book. When you use your smart phone, you can access enhanced digital content about the various recipes. The Simon and Schuster website also has this content available. Another really neat (and surprise-to-me) feature of this cookbook occurs when you turn the entire cookbook upside-down and then over. The "back" of the cookbook is another mini cookbook put together by Ms. Ray's husband John Cusimano titled MY YEAR IN COCKTAILS. This cookbook is actually terrific (and perfect for this time of year) since it includes more than 100 recipes for adult beverages. I'm not a big drinker, but I can tell you that many of these recipes looked fantastic, and I've already given my bartender (I mean husband!) a list of a few that I'd like to sample. When it came time to pick on recipe to sample, I decided to make the Five-Minute Fudge Wreath. I had seen Ms. Ray make this on her show year's ago and thought it looked adorable. It didn't hurt that it was very simple (note "five-minute" in the title). I'm not a huge fudge fan, but I thought it looked cute to set out at a holiday party or share with a neighbor. The ingredients are fairly simple -- chocolate chips, butterscotch chips, sweetened condensed milk, vanilla extract, walnuts and dried currants; and you just melt the chips, milk, and vanilla and then stir in the nuts and fruit. I am not a currant fan so I substituted dried cranberries. You pour it all in an 8-inch round cake pan (with the leftover sweetened condensed milk can in the middle) and let it set for a few hours in the refrigerator. You can also decorate with candied cherries or a bow. Easy peasy! I was pleasantly surprised by the fudge -- it was actually pretty good, but I wouldn't go so far as to say it was great. But I'm not a huge fudge fan, so I might not be the best judge. (I was happy that the fudge didn't have too strong of a butterscotch flavor because I'm not the biggest butterscotch fan either.) I do think the nuts and dried cranberries definitely added to the overall taste though! This recipe makes about two pounds of fudge and the wreath ended up looking pretty cute. I think it would be a hit at a party. 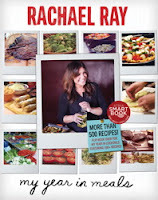 I'm sure fans of Rachel Ray's will enjoy this cookbook, and there are some very good recipes in it. I'm just not sure it would be one of my go-to cookbooks. Sounds like this cookbook is pretty "modern"! I also think I like the theory of her meals more than the meals themselves! My mom likes Rachael Ray but, I'm like you, I think she relies on convenience foods too much. Having said that, your fudge looks adorable. I may have to check this one out. I've made several of Rachael's recipes but haven't picked up this book yet. Thanks for the great review. I too haven't been overly happy with Rachael Ray's recipes but the fudge wreath looks so festive! I actually tend to like Rachael's Ray's recipes. I'll definitely be picking this one up sometime.